It’s not just for Christmas anymore! Our LED patented sealed bulb won’t fail in the rain or snow, we are so confident in our products we back them for three years. 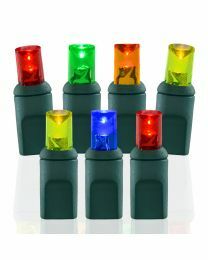 LED Christmas Light sets are currently the most popular light product on the market and we have the right shape and colors for you. We decorate more and more residential and commercial properties every year. We provide either the new incandescent bulb or LED bulbs. We strongly recommend the newer LED bulbs for many reasons. We can outline your roof in clear white, solid colors or multi-colored Christmas and Holiday Lights. Each bulb is individually clipped into place to give you a “clean, straight, evenly-spaced” look. We use a variety of attaching methods to give you the best look while still allowing for the lights to be removed when the season is over. The work we provide is simple. Call us for any occasion. Even if you just want to spice up your home or business with some decorations. We have decorations of all sorts, but our specialty is lights. We can decorate anything from a room indoors, to a picnic area in your backyard. Packages based on the size of the job, location, supplies needed and labor costs. Our labor is clean, fast and efficient. Our team will leave no mess, work around your schedule all while accommodating your needs.